I think if you would have told most folks into high-end audio 15 years ago that there would be new turntable designs in the late 1990s, they'd have laughed. In fact, most would've recommended you check out the new brace of mood-altering drugs that have become the Chiclets of the last decade. Heck, claiming there'd even be turntables still in use and new LPs pressed would've garnered the same looks reserved for those who claim to converse with the Space Brothers through an implant chip behind the ear. Maybe I'm exaggerating a bit, but I think you get my general drift -- the more things change, the more they stay the same. In fact, the old vinyl LP and the phonograph have proven as hard to kill off as, say, those nasty little Zanti Misfits from one of my favorite episodes of "The Outer Limits," or even those good old vacuum tubes. Lots of folks prefigured the tube for the La Brea Tar Pits of audio about 20 years ago. In fact, I remember being a novice high-school guitar player in the early 70s. I was in a music store looking at a new line of solid-state guitar amps by a company renowned for its classic tube guitar amps. They sounded nasty, even my 16-year-old ears told me that. Plus they had goofy 70s pseudo-hip zodiac names like "Scorpio" and "Taurus." I still remember the smarmy sales guy telling me, "Son, I'm telling ya that tube stuff is gonna be gone in another five years. You won't be able to even get em!" What's great is that I think about his cheesy rap every time I turn on my 1965 Fender Deluxe Reverb guitar amp or look at a high-end mag full of reviews of multi-bottled stereo amps. If I seem to digress, I'm just trying point out that the old vinyl LP, like the vacuum tube, seems to have more staying power than anyone could've imagined. In fact, a bunch of rather new analog-based companies -- Immedia, Wilson-Benesch, and Basis -- have not only come on the scene, but expanded their lines. Old stalwarts like VPI, Linn, SME and Rega have survived and released some of their best products of late. Another firm that should be mentioned among the latter is Pink Triangle Projects of the UK. Although not as well known in the US as the others, Pink Triangle has been in operation for over 15 years and are a renowned maker of high-end turntables as well as digital playback sources. In fact, Pink Triangle is cited with a number of innovations in audio design. 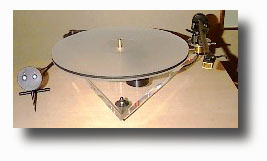 These include the first turntable to use an inverted jewel (sapphire) bearing and the acrylic platter, which more closely matches the impedance of the vinyl disc than other materials. They are also advocates of the DC motor over the AC synchronous motor. The theory is that DC motors, when properly implemented, are quieter, have minimal vibration, and are less influenced by mains-supply fluctuations than AC motors. Along this line of thinking, Pink Triangle also uses battery power supplies in their more expensive products. This further frees a component up from the ill effects of AC-line impurities. Pink Triangle also has a reputation for making visually striking products as well, and their new entry-level turntable, the Tarantella, is no exception. The Tarantella is Pink Triangle's take an a more cost-effective design while striving to maintain the companys unique visual aesthetic and standards for high-quality playback. The Tarantella consists of an acrylic platter that rests on a suspension of three specially designed elastomeric pods. The same high-quality inverted sapphire bearing used in Pink Triangle's flagship table, the Anniversary, does duty here, and in accordance with the companys philosophy, a DC motor drives a flat belt which spins the entire the platter. The DC motor is controlled by a power-supply unit that Pink Triangle has humorously named "the Hornet." Its a small round cylindrical affair that rests on a big spike and has two buttons that activate the two speeds (33 1/3 or 45 rpm, duh!). It is kind of ominous-looking in a way, and hence the name, I guess. The speeds are indicated by green and red LEDs on the "face," and the Hornet plugs into the back of the motor. The whole shebang is powered by a 120v 60Hz wall wart which brings the line down to DC for the Hornet and the motor. One other use for the Hornet occurred to me during the audition period. If one of your audiogeek friends complains about your system's colorations you can gouge em' with the Hornet's spike. Hey, just joking folks! Besides I don't think Pink Triangle would endorse such use or behavior among mature audio-loving adults. The armboard consists of a small round Lucite circle which is connected to the suspension via a metal tube. Everything sits on a clear Lucite triangular base that rests on three cones for support and is backlit with red LEDs. This provides the Tarantella with its distinctive look. It's what I would describe as "retro futurism." In fact, the turntable reminds me of what some early 1950's artist who worked for technology magazines such as Popular Science would envision record players looking like in that "far off year 2000." Distinctive looks wouldn't matter if the overall fit and finish of the Tarantella was not of a very high quality. However, this turntable is built to a high standard. The quality of machining on the triangular Lucite base, for example, is something to behold. Since there's no traditional plinth as such, one could describe the turntable as a skeletal design. The table is compact, with a 12" footprint, and weighs in at 11 pounds. The Tarantella was primarily designed for use with the Rega tonearms, and my sample was supplied with the ubiquitous but fine RB250. The table itself retails for $1295, but can be purchased in a package with either the Rega RB300 or AudioQuest PT-6 arm for $1795. Brian Tucker at ProAudio, Pink Triangle's US distributor, informed me that provisions have been made for more upscale arms such as the Naim Aro and Wilson-Benesch ACT models. These arms, however, require a different subchassis and arm tube, so consult thy dealer in this case. The arm is relatively easy to mount and remove. Just unscrew the armboard screw underneath the board and remove the arm. It's easy to access as it is suspended in air off the arm pipe. Since initial cartridge mounting is often easier with the arm off the table, this means less teeth grinding for you, the LP lover. I would describe the Tarantella as an easy-to-use, "fit and forget" turntable. Pink Triangle's directions say to set the table on a level surface and position the Hornet controller in a convenient place nearby. Then plug the wall-wart power pack onto the back of the Hornet. This is all true, but I would add a caveat. The Tarantella, like all turntables, benefits from and requires proper support. I would recommend using a dedicated, light-but-rigid turntable platform such as those from Target, Mana or Sound Organization. These will serve to isolate the table from room interactions and can be properly leveled for maximum performance. You can throw the Tarantella on a coffee table or top of an equipment rack, but you won't be getting the most out of it. During the review period I listened to the Tarantella/ RB250 combo on my trusty Sound Organization turntable wall stand. I used my current cartridge, the Dynavector 10x4 high-output moving-coil cartridge. I'm very impressed with this cartridge in terms of its tracking and musical performance. Also, its price point ($325) puts it in the range of something folks might likely pair with this table and arm combo. Amplification was via the Exposure 17 preamp and 18 power amp combo, and this ran to my Spendor 2/3 speakers. Cabling was by Exposure and Ray Kimber. I never fail to amaze myself at how I manage to keep these system descriptions so colorful. But now onto the meat of the matter; how well the Tarantella dances with vinyl. One of the first records I threw on the table was Miles Davis Some Day my Prince Will Come [CBS PC8456]. Right off the bat I noticed that everything was right timbrally. Miles' trumpet had a sense of solidity, and his phrases were not blurred and made sense musically. Drummer Jimmy Cobbs' cymbal and brush work were well defined, and pacing was good overall. The Tarantella seemed to do a better-than-average job of space and depth portrayal, which are areas that give most budget tables grief. Paul Chambers bass was full, and the notes had good definition, although I thought the plucking attack on the strings was truncated. This is minor point, but it robbed the music of some of its forward flow. I would characterize the sonic presentation of the Tarantella as lucid. What I'm talking about here, and I mean this in a in a positive sense, is the Tarantella allows you to relax into the music. I've noticed is that many budget source components make up for a lack of refinement by thrusting the music forward due to the goosing up (or down) of certain frequencies. This also seems to be a way of compensating for the inability to resolve fine detail. I know something has to give at lower price points -- that's the nature of the game. My impression is that the Tarantella avoids this problem to a large degree. On the Jayhawks Sound of Lies [Def American 43114-1], the Tarantella was effective in resolving the layers of detail on this multitracked rock recording. The track " Haywire" built nicely in terms of dynamics, and the lead vocal remained distinct and wasn't swamped by the rest of the music. I think the mark of a design that works regardless of price point is a components ability to allow the listener to get into the music without too much focusing on sonic trivia that often obscure the musical message. The Tarantella does this. The Tarantella did an exemplary job of handling vinyl surface imperfections. In this area alone it earns its money as being worthy of its price point above most entry-level budget tables. My copy of Bill Evans A Portrait in Jazz [OJC 088] is not, in typical OJC fashion ,the quietest slab of vinyl around. The Tarantella, however, allowed me to enjoy the music free of the distractions of tic and pops, and like most top-flight turntables, it rendered them unobtrusive to the music. Next up I listened to Hindemith solo Violin Sonatas No.1 [Telefunken 6.425.31]. Christian Edingers violin tone was warm, and pitch stability was very good. Big orchestral sounds were enjoyable, but the Tarantella didnt quite dig as many thrills out of symphonic music as some other tables. The Haitink/Concertgebouw version of Ravel's Rapsodie Espagnole [Philips 9500347], for example, was a bit too laid-back to really draw out the contrasts in dynamics and the orchestral colors that make Ravel's music one of my favorites. To my ear, the Pink Triangle Tarantella lends itself better to small-scale classical music than blockbusters. As part of this review I decided to compare the Tarantella to the Rega Planar 3. One reason for is that in terms of price, the Pink Triangle Tarantella falls between the Rega turntable (which dominates the budget sector) and the higher-priced spread. This begs the question: Is the Tarantella the next step for someone wanting more resolution in LP playback but who can't quite afford of justify the expense of the big-time spinners? Also, as I stated earlier, the Tarantella is designed with the Rega tonearms in mind, so maybe you see where I'm going here. Don't ever accuse me of not trying to save you some money! I borrowed a Planar 3 and threw the Dynavector 10x4 on it to see where this would lead. Well, it was an interesting place, folks. I used the same LPs, including the Bill Evans Portait in Jazz and the Jayhawks Sound of Lies to start off. I could easily hear why the Rega table is well regarded. Its flaws are sins of omission, and it always errs in the cause of music over sound. In many ways the Rega has more of the pace factor going for it. This is the thing that makes the Rega table fun to listen to on rhythmic stuff like rock. Pretty quickly, though, it became apparent that the Planar 3 is nowhere the full-range affair that the Tarantella is. The Rega table truncated details at the expense of maintaining rhythmic flow, and everything sounded a bit shelved down in terms of timbre. The Tarantellas handling of record surfaces was far better than the Regas, and the spaces between notes were more defined. This allowed the music to breath more spatially. The Evans record was enjoyable on the Rega table, but the Tarantella made the music more involving for me. This wasn't just due to sonics though. With the Tarantella, the interactions between pianist Evans and the other players was highlighted better. Classical music benefited from the more refined sound of the Tarantella overall, but in terms of dynamics, the Rega Planar 3 was not overly embarrassed by the more expensive table. So, in the long run, is it worth it for someone to move up from something like the Rega Planar 3 to the Tarantella? That's a tough call, and one I can't make for you, friends. One advantage is that if you're using a Planar 3 you'll already have one of the Rega arms which are a synergistic match with the Tarantella. It will also depend on your system -- where it's headed -- and of course the size of your LP stash. Analog lovers with a yen for more resolution, especially if other components are more upscale, may want to give the Pink Triangle Tarantella a hearing. The Tarantella is a well-made product with a distinctive look that will have an appeal, although some may find it a tad too wild visually. Again, I can't overstress the importance of proper placement. The Tarantella is not a high-mass turntable, and the unique suspension may take some getting used to in terms of cueing up records. So having a solid platform for the Tarantella will be vital for ease of use and maximizing musical performance. Aside from all these factors, I found the Tarantella to be a refined and musically rewarding record player. A hunch tells me that if you get to hear it you'll be spending a lot of time listening to LPs -- and maybe dancing. Prices: $1295 USD alone, $1795 USD with Rega RB300 or AudioQuest PT-6 tonearm. Unit B43 Skillion Bus. Ctr.